Netflix just made it a lot easier to keep the kids entertained when they're at your house on Thanksgiving. Picking quality cartoons for your "kids" to watch on Netflix Instant hasn't been easy (I mean, you're certainly too much of a grown-up to watch such things, right? ), thanks to how the service has been organized. However, Netflix has just unveiled a new section called "Just For Kids", designed to help you find new shows and movies that your kids (and hopefully you) will enjoy watching. However, this new section is only available on PC, Mac, and Wii. Simply selecting Just for Kids within the Netflix app for Wii takes Netflix members to a section that's perfect for their children 12 and under. Parents and kids can click on their favorite kids characters - from Phineas and Ferb to Elmo - and find a broad selection of great TV shows and movies featuring that character. 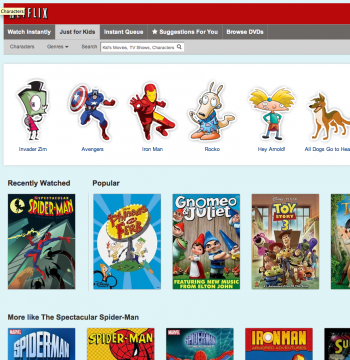 The Netflix Just for Kids section lets users scroll through row after row of TV shows and movies organized by easy-to-understand genres like superheroes, princesses, dinosaurs and girl power, featuring clear and simple descriptions of the plot of each title. Netflix uses ratings and reviews from Common Sense Media in developing the selections. Common Sense Media provides independent ratings, reviews, and information to help parents make great media choices. It's certainly cool that Netflix has gone ahead and created this new section, though it's a little strange that it's only available on the on so few platforms. However, the company has announced that Just For Kids will arrive on other devices "over the next year."